I still look like I did last week. But I’m powering through. I live in Transylvania County, North Carolina, and if you haven’t guessed from the name, we are serious about Halloween. This Saturday (Oct. 26th) is the annual Halloween festival. Downtown will be blocked off for food and craft vendors, stages filled with live, local music; there’ll be the annual Pumpkin Roll down the hill from the Courthouse, a hay ride, costume parade and more. After hours Oskar Blues Brewery will kick off Osktoberfest with food, music, and good beer. There truly is something for the whole family here! The festival will also feature Mountain Mash, an old-time bluegrass competition, to be held at various times during the day. For more info about Osktoberfest, and all the beers and bands, click here. My family and I have been trying to get out to this quirky little blast of a Halloween event for a couple of years now. We plan to make it happen before Halloween! Located on a farm in Pisgah Forest, NC, Stingy Jack’s only opens on the weekends and in the evenings, and has a pumpkin carving contest, a spooky trail, enchanted hayride, and something called Stingy’s Ultimate Pumpkin Chunker, which is sure to appeal to the kids and the dads in the crowd, especially. Yes, this is random, and has nothing to do with Fall festivities. Humor me. 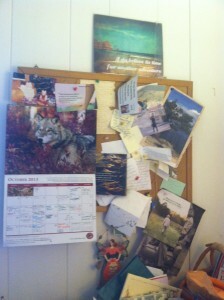 This is my bulletin board. It hangs on the wall to the left of my neat-as-a-pin writing desk. Why are you laughing? It’s not my story board–that’s different, and contains all kinds of notes on scrap paper, photographs, and anything inspiring me or having to do with my work-in-progress. 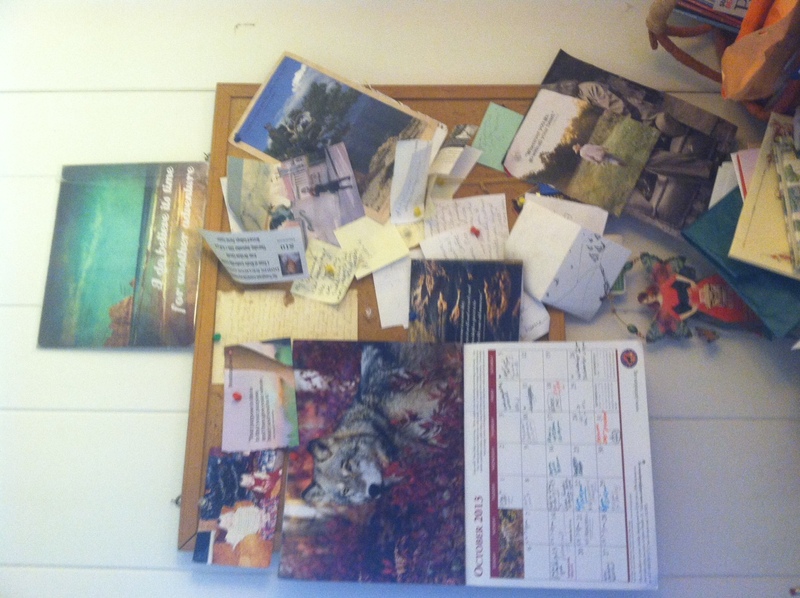 The bulletin board holds my calendar, photos, the little reminder cards from the doctor’s office, etc. It also has stuck to it whatever quotes are speaking to me, my life, and my current (often crazy) state of mind. Here are a few that I’ve lately found to be relevant. Basically, they shout to me from the bulletin board. This entry was posted in Autumn, Bell Bridge Books, BelleBooks, creativity, Fall, family, inspiration, Katherine Scott Crawford, life, motherhood, mountains, NC, writing and tagged Autumn, bluegrass, Brevard, brewery, Buddha, Confucius, Fall, Halloweenfest, John Le Carre, live music, Mountain Music Mash, NC, Oskar Blues, Osktoberfest, Pisgah Forest, Ralph Waldo Emerson, Stingy Jack's Pumpkin Patch, Transylvania County, WNC. Bookmark the permalink.